“What’s going on? Is it the economy?” he asked. These types of conversations come up more frequently now in my interactions. I believe we are in the midst of a revolution of sorts. 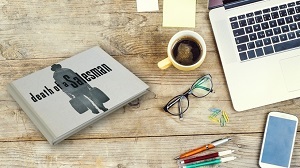 To be a Willy Loman-type salesperson, with briefcase in hand, has stopped being effective. It was the company salesperson that used to be the primary educator of prospects as they worked through the buying process in days past. That’s not so anymore. Prospects now begin their search for a solution to their problems online — no longer by calling sales reps. The companies and individuals who provide those online answers are the ones in the driver’s seat to win business relationships. They literally pull customers in by luring them with information on demand. It’s a non-threatening and prospect-driven process. The prospects will self-determine how hot they are as leads. You might be thinking, “Yeah yeah…that’s not new information. The Internet has been around for decades now.” The real question is this: How do you adapt if you are a seasoned salesperson? The good news is that the general skills you may have acquired from the old economy are not wasted — it’s just that the methods of communication and the ways you generate leads have changed. 1. Do I really understand who my best possible customer is? That may sound elementary, but I challenge you to think way deeper. What are the emotional triggers and motivations for someone to do business with you? Appeal to that. 2. Am I really an expert? If you have all the knowledge you need locked up in your brain, you are doing yourself a disservice. Get that information out there so that your prospects can start to learn that you are the expert you say you are. Think content! Videos, white papers, ebooks, infographics, webinars — you get the idea. 3. Am I connected digitally? It’s time for a digital audit. Does your company have a website packed with useful information? Or is it still stuck in web 1.0 — merely a digital billboard? Can interested prospects qualify themselves by giving their contact information in exchange for downloading your remarkable content? Is social media created and updated regularly? Are custom emails built? 4. Do I have a defined system to move suspects to prospects and prospects to customers? Skip the “touching base” calls only to be put off another month. Instead, let technology carry that load for you by automating the follow-up process. Try to get to a point where the only time you pick up the phone is when you have only the hottest of hot prospects interacting with you. Watch your close percentage skyrocket. Turn yourself into an order-taker. 5. How am I measuring your success? Taking a look at your pipeline and forecasting sales is old school. Stop doing that. Imagine the data you will have when you can see how many people downloaded your ebook, and from there, how many requested a demo. Imagine actual percentages and work on maximizing them with different offers. Now you can accurately determine what your monthly, quarterly or yearly sales will be. So is the salesperson dead? Has technology taken over this profession like it has so many others? The answer is not yet and it probably never will. However, the strategy to be successful has certainly changed, and those who understand this will give themselves a competitive advantage. There is still time to adjust, but you certainly have to be dedicated to the effort — or risk becoming a dinosaur.